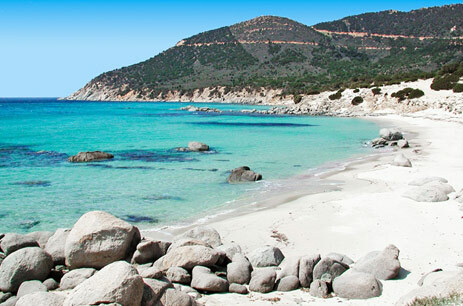 Villasimius coastline is among the most spectacular in Sardinia, with its white sandy beaches and great natural heritage, which is part of the Marine Protected Area of Capo Carbonara. 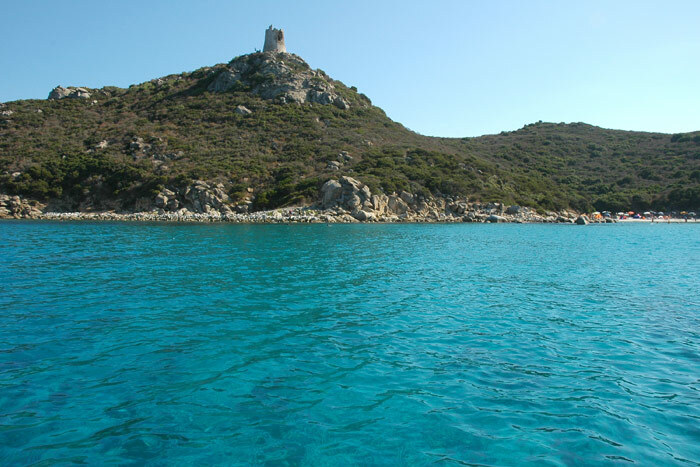 It is naturally divided in two by Capo Carbonara promontory, the south-eastern outcrop that is the natural continuation of Serpeddì Massif – Sette Fratelli mountain range – that runs into the sea like a sharp sickle and ends opposite Cavoli Island. 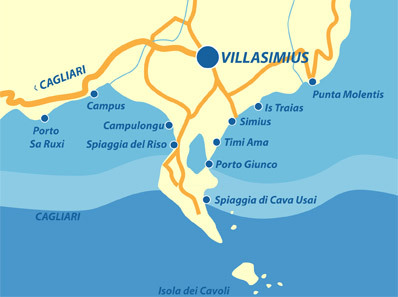 Thanks to these peculiar geographic characteristics, Villasimius has a varied coastline: long sandy beaches, majestic cliffs, tiny bays hidden in lush Mediterranean vegetation. 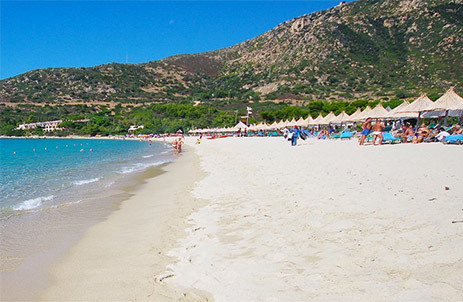 To help you plan your holiday in Villasimius, we have made a list of the Top 10 beaches in Villasimius. You decide which ones to start from, but make sure you visit them all! A thin strip of sand divided into three bays, Porto Sa Ruxi is an enchanting beach with a wild charm, protected from the north-west winds by the lush Mediterranean vegetation and the rock formations right behind it. Set between two promontories, Campus is a long golden sandy beach that offers a number of services: food and drink kiosks, umbrellas, sun loungers, pedal boats and canoe hire. A short walk from the area that shares the same name, the natural beauty of the Campulongu beach is protected by a lush pine wood. As it is one of the most popular beaches in the area, it is often crowded during the summer months. 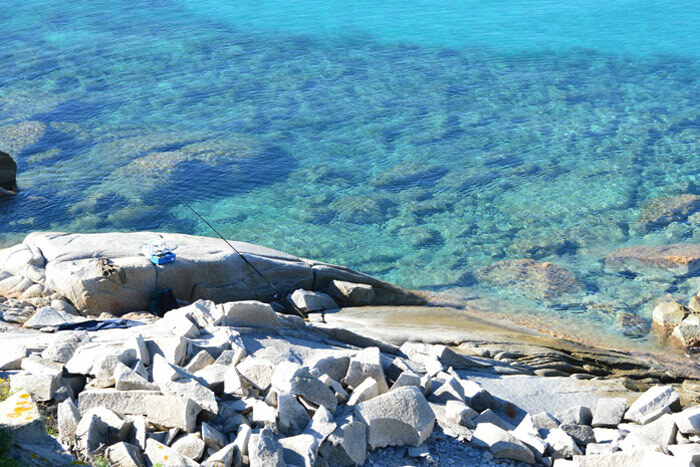 Among the most iconic beaches in Villasimius, Spiaggia del Riso owes its popularity to the incredibly white quartz grains of its sand. The shallow and transparent water adds to the beauty of this spectacular beach. Practically “carved” out of the wildest area in Capo Carbonara, the small and secluded Cava Usai beach is the ideal spot if you are looking for privacy. Its large granite pebbles are mixed with medium grain sand. Its fine white sand and transparent water, framed by Mediterranean vegetation, feature in the most popular postcards of Sardinia. Absolutely unmissable. 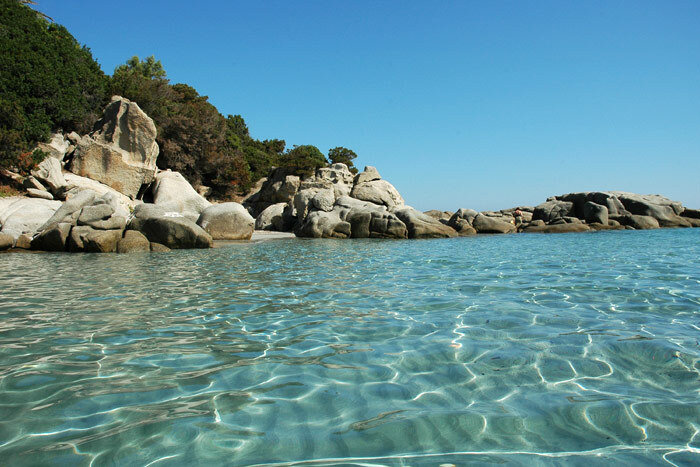 Located between the beaches of Porto Giunco and Simius, Timi Ama is a fine white sandy beach set between two large rock formations. 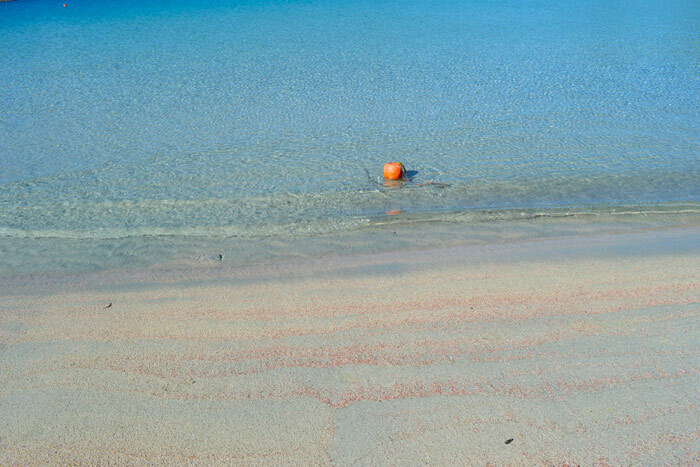 The seabed is sandy and shallow and the water is crystal clear. 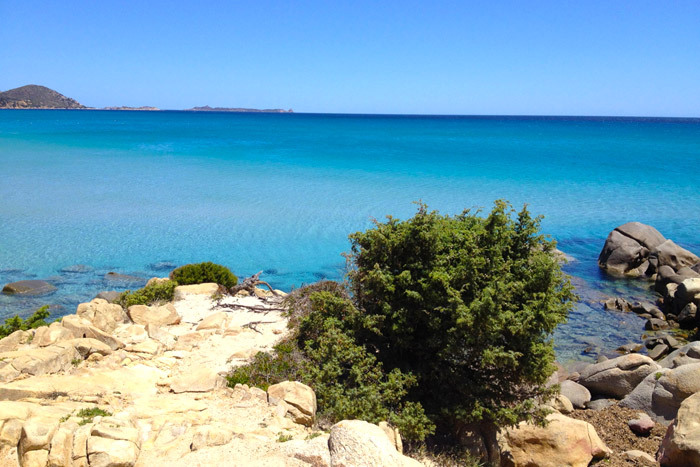 Simius is a wide white sandy beach, over one kilometre long, with beautiful shallow turquoise waters. It offers a number of services and spectacular hinterland views. 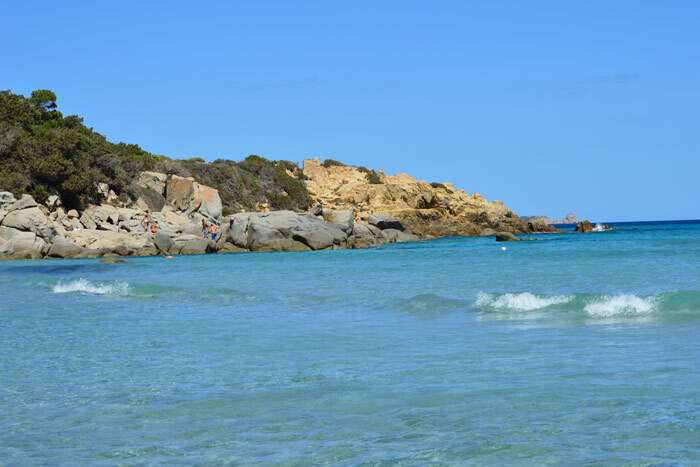 Framed by rocks and lush Mediterranean vegetation, Is Traias is a little fine sandy beach, with no services, that will amaze you with the incredible colours of its water. 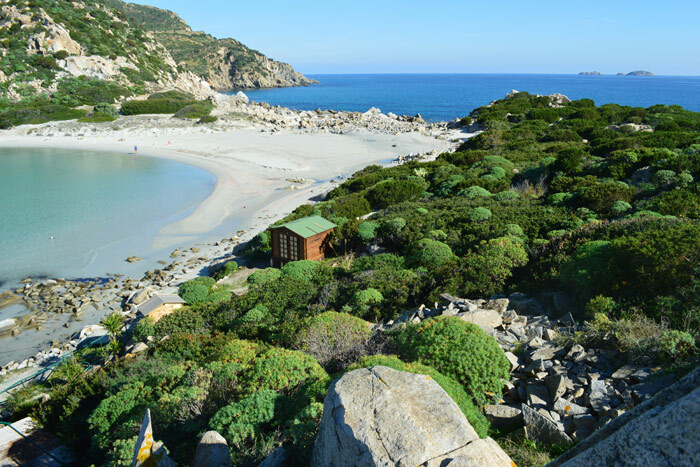 A thin strip of sand and rocks that connects the Punta Molentis promontory to the mainland, offering enchanting views of the rock formations and a spectacular white and pink sandy beach.